This shot is one of my all time favourites. 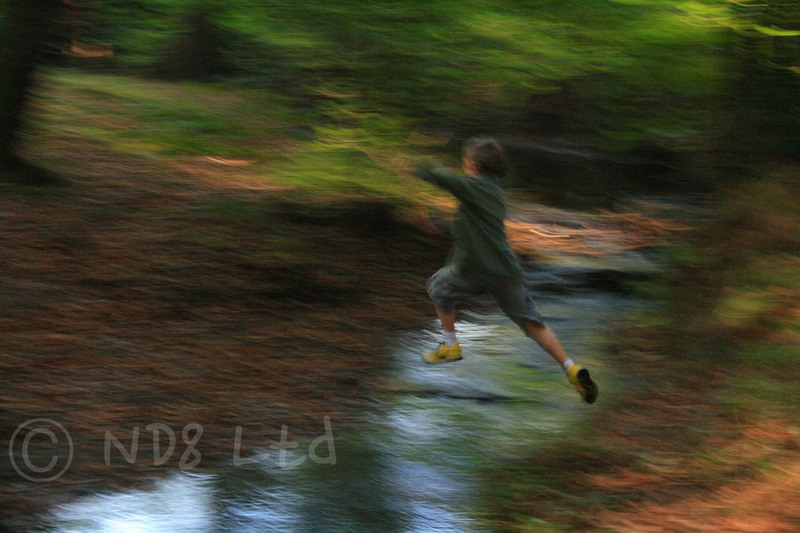 The kids were jumping over the stream in our local woods. The light was pretty weak so the shutter speed was down at 1/15 as I panned to follow Sam as he made the jump. When I hit the button the flash fired. The result was a combination of colour, movement and frozen action, that just works. I’m sure for professionals this is a pretty standard technique; for me, back to using an SLR after twenty year break, it was a complete accident and fantastic discovery. I guess the lesson for anyone listening, and new to photography, is not to get too bogged down with the “proper” ways of doing things. Instead simply experiment with speeds, apertures and compositions as much as you can. You’re on digital now so who cares how much digital film you waste! Who knows perhaps you too will make your own great discovery.